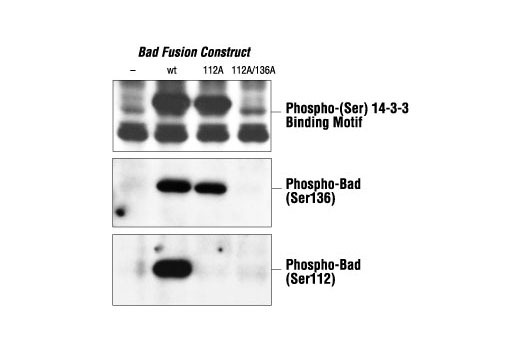 Western blot analysis of extracts from 293 cells transfected with Bad or Bad Ser112 and/or Ser136 mutant fusion proteins, using Phospho-(Ser) 14-3-3 Binding Motif Antibody (top), Phospho-Bad (Ser136) Antibody #9295 (middle) or Phospho-Bad (Ser112) Antibody #9291 (bottom). 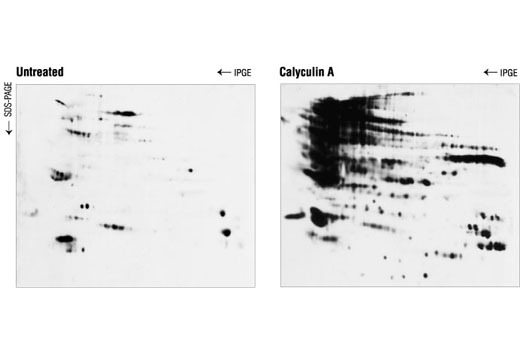 Western blot analysis of extracts from Jurkat cells, untreated or calyculin A-treated (0.1 µM for 30 minutes), using Phospho-(Ser) 14-3-3 Binding Motif Antibody. Proteins were separated by 2-D electrophoresis prior to blotting. 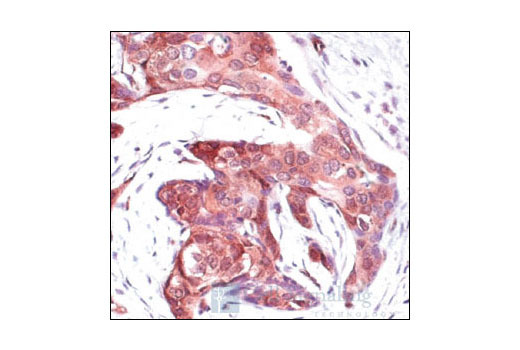 Immunohistochemical analysis of paraffin-embedded human breast carcinoma, showing staining of proteins containing phosphorylated 14-3-3 binding motifs, using Phospho-(Ser) 14-3-3 Binding Motif Antibody. Polyclonal antibodies are produced by immunizing animals with synthetic phospho-(Ser) 14-3-3-binding-motif containing peptides . Antibodies are purified by protein A and peptide affinity chromatography. The 14-3-3 proteins are a highly conserved family of proteins involved in the regulation of cell survival, apoptosis, proliferation and checkpoint control (1-5). Biological regulation by 14-3-3 is mediated through phosphorylation-dependent protein-protein interactions (6). Two different phospho-Ser-containing motifs are found within nearly all known 14-3-3 binding proteins (7). 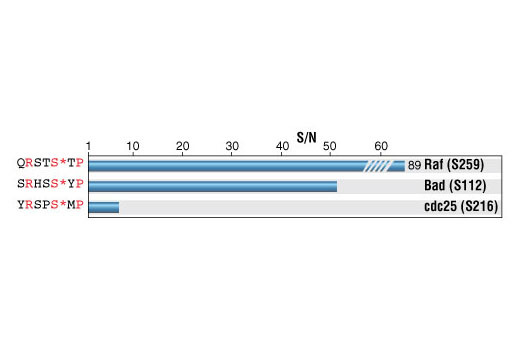 Motif 1 (Arg/Lys and Ser at positions -3 and -2, phospho-Ser at position 0, and Pro at position +2) is found in critical regulatory proteins including Bad, cdc25C, FKHRL1, PKC and c-Raf (5,7). Phospho-(Ser) 14-3-3 Binding Motif Polyclonal and (4E2) Monoclonal Antibodies provide powerful tools for the discovery and characterization of potential 14-3-3 binding proteins containing this motif and for high throughput drug discovery. Aitken, A. (1995) Trends Biochem Sci 20, 95-7. Zha, J. et al. (1996) Cell 87, 619-28. Piwnica-Worms, H. (1999) Nature 401, 535, 537. Tzivion, G. et al. (1998) Nature 394, 88-92. Xing, H. et al. (2000) EMBO J 19, 349-58. Muslin, A.J. et al. (1996) Cell 84, 889-97. Yaffe, M.B. et al. (1997) Cell 91, 961-71. Use of Cell Signaling Technology (CST) Motif Antibodies within certain methods (e.g., U.S. Patents No. 7,198,896 and 7,300,753) may require a license from CST. For information regarding academic licensing terms please have your technology transfer office contact CST Legal Department at CST_ip@cellsignal.com. For information regarding commercial licensing terms please contact CST Pharma Services Department at ptmscan@cellsignal.com.